The original church, constructed on reclaimed land from the river, probably dated from around about 870. King Edmund 849-870 had many chapels dedicated to him at this time, so a Saxon church on a possible Roman or Saxon ford may date from this period. St Edmund's was one of the chapels mentioned by Peter de Palerna in his will during the reign of King John (1199-1216). He left the sum of 1 penny per year to each of 28 chapels, including St Edmund's. Walter Gervase had the Exe bridge constructed from 1190, incorporating a newly built chapel of St Edmund's, replacing the old structure. There was a chapel at the ST Thomas side, which was lost in a flood; the present St Thomas the Apostle Church is on the site of its replacement. Gervase was Mayor of Exeter in 1231 and 1239 and was buried along with his wife, in a small chantry chapel, dedicated to the blessed Virgin, built on the bridge opposite St Edmund's. 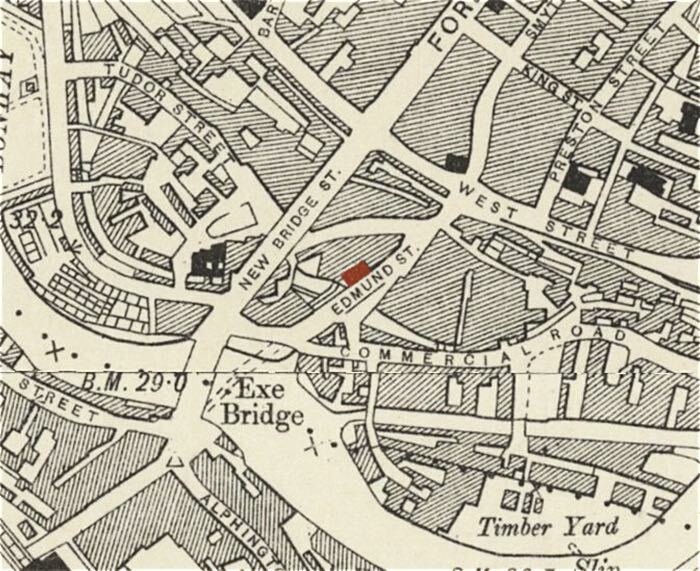 In 1833, this small chapel was removed and the bones of a tall man were said to be found under the floor, to be re-interred in the same spot, under one of the piers of the bridge he had built. St Edmund's itself has also been referred to as St Edmund's on the Bridge and even the Chantry on the Bridge. The first rector of St. Edmund's was instituted by Bishop Bronescombe in 1259; he named himself John de ponte, in recognition of his role as rector of the chapel on the bridge. 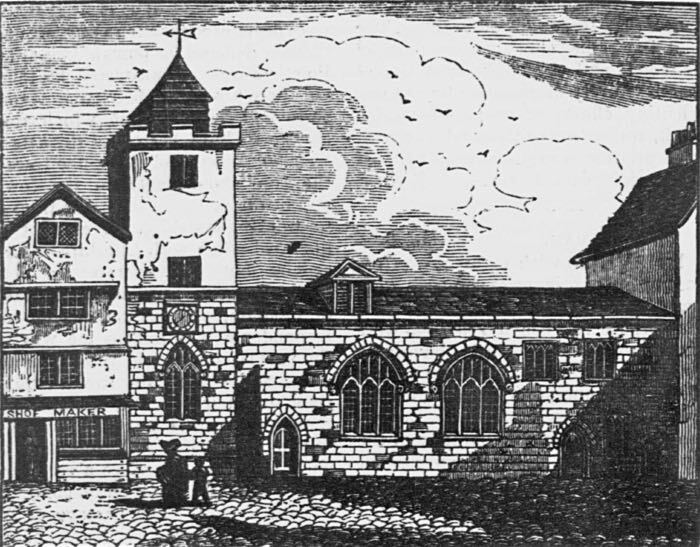 "The sketch from which the present wood-cut was made, was taken from an opposite window, on 1st August 1830, at which time the demolition of the Church was talked about. A crack was visible in the north wall; but probably the fondness for improvement which had led to the building of several churches in the city, was the actual cause of its demolition. The protecting Genius of the Church would exclaim ‘repair’, but ‘not destroy;’ but this small still voice would be drowned in the yells of the Demon of Improvement." This is the only description of the pre 19th Century church, from the same article. 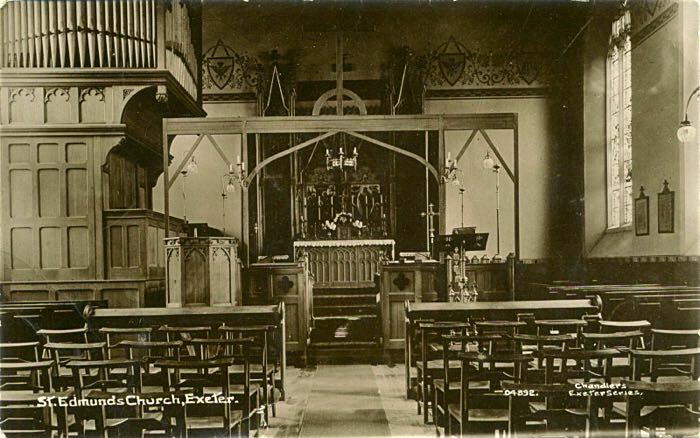 The exterior, as far as could be seen, was built of the red sandstone so common in the buildings of Exeter. The mullions and arches of the windows and doors, were executed in freestone, forming a pleasing variety. The door cases and the two windows in the Church, are of the latter part of the fifteenth century. The square windows and door towards the east, are not earlier than the reign of Elizabeth, and were probably constructed when the Church became parochial. This portion of the structure may have been the resident of the chantry priest at a prior period. The upper part of the tower, with its ugly leaded spire, is a manifest addition of more modern times. The interior consisted of a nave and side-aisle, divided by arches, either circular or very obscurely pointed, the columns octagonal, with moulded caps. 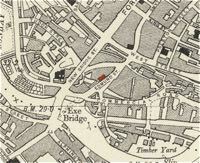 Galleries, which occupied the west end and north side, were ornamented on the front with round arches, within which were painted the royal arms, and those of the see and city of Exeter, and the twelve apostles. The style of decoration bespoke the age of the galleries to be of the period of James the First. In the western gallery was the organ; which, like that of the cathedral, had some of its pipes disposed on the walls at the sides. their parishes united, and the rest of the churches sold or used as burying places or schools. 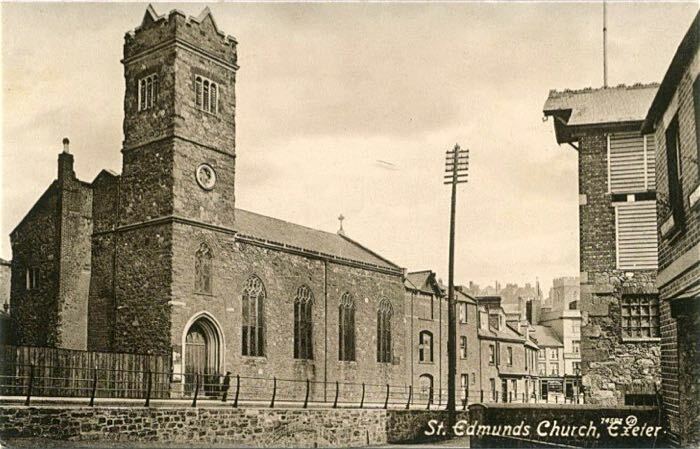 St Edmund's was one of the four along with St Petrock's, St Mary Major and St Mary Arches. 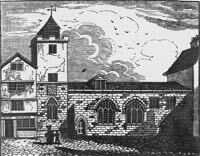 In 1833, the church was rebuilt at a cost of £2,000. 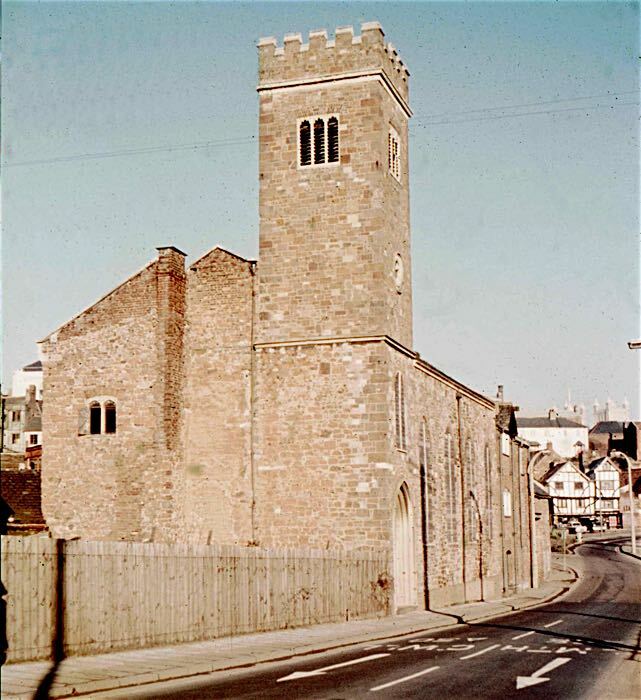 It was a cement rendered structure, using material from the old church, with most of the original tower retained, and a peal of eight bells; the treble, fifth and tenor were dated 1833, while the remaining five dated from 1731. Internally the church had an altar screen presented by Lord Rolle, and choir screens were installed in 1888. The register of baptisms and burials date from 1571 and marriages from 1572. 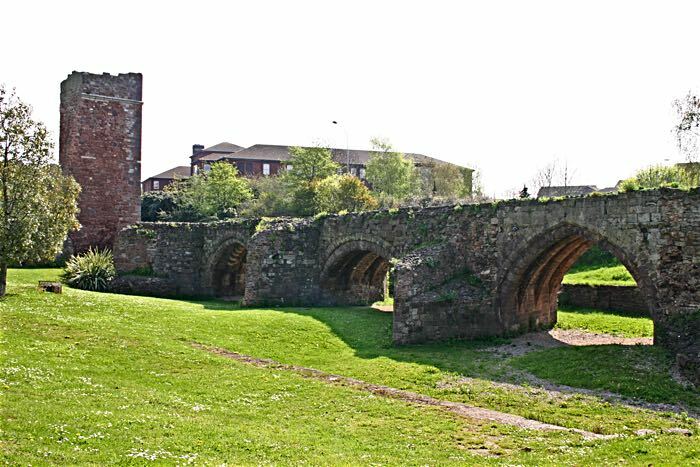 The Parish of St Edmund's stretched from the ancient bridge, across Exe Island and Bonhay, almost to Head Weir with its north western boundary under the walls of Exeter. The population of St Edmund's in 1801 was 918, which increased considerably during the 19th Century as industrialisation spread across the area. The last time the church was used for regular services was in 1956, before it was damaged by fire in 1969. 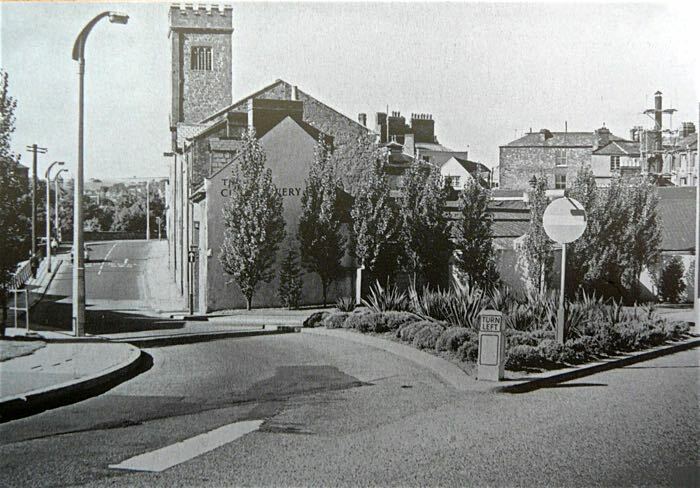 The traffic scheme of the 1960's and 70's that created Western Way required the demolition of many properties in Edmund Street—work to demolished the church commenced in 1973. 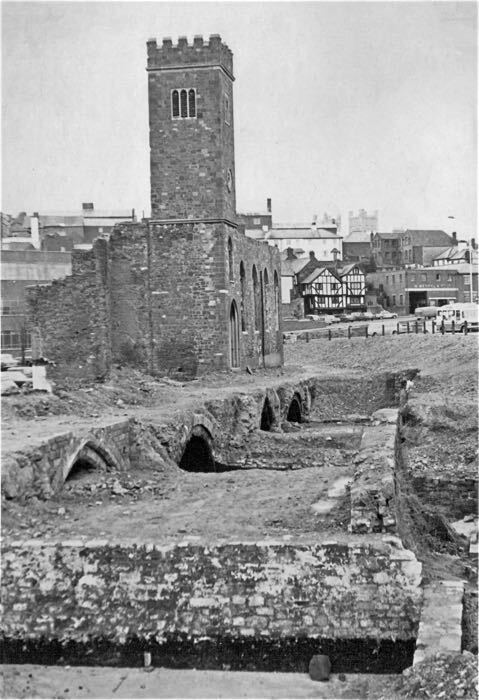 While the demolition was in progress it was realised that it was on the remains of the old Exe bridge, allowing archaeologists to excavate it in 1975. 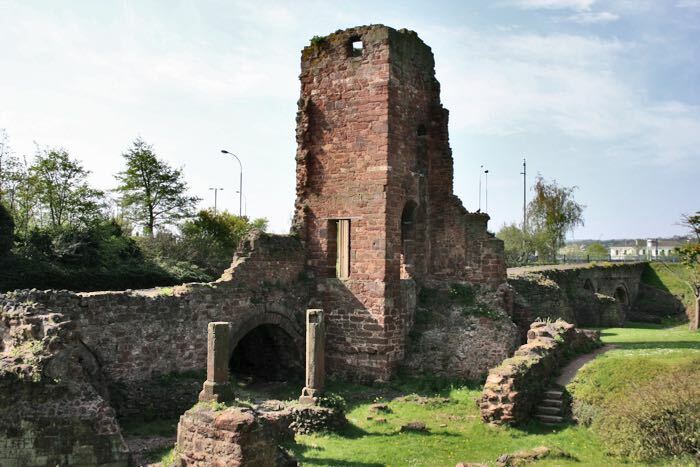 Even though the demolition had been extensive, restoration work by Dart and Francis of Crediton was undertaken to stablise the remaining tower, and allow access. Sources: White 1850, Kelly's 1897, Exeter Churches by Edith Cresswell and the Devon Record Office, Gentleman Magazine 1835, Peter Dare. The woodcut in the Gentleman Magazine of 1835. 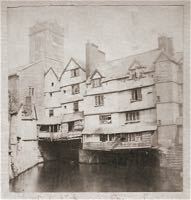 St Edmund's before it was partly demolished and rebuilt. Notice the pointed tower and the house on the left. 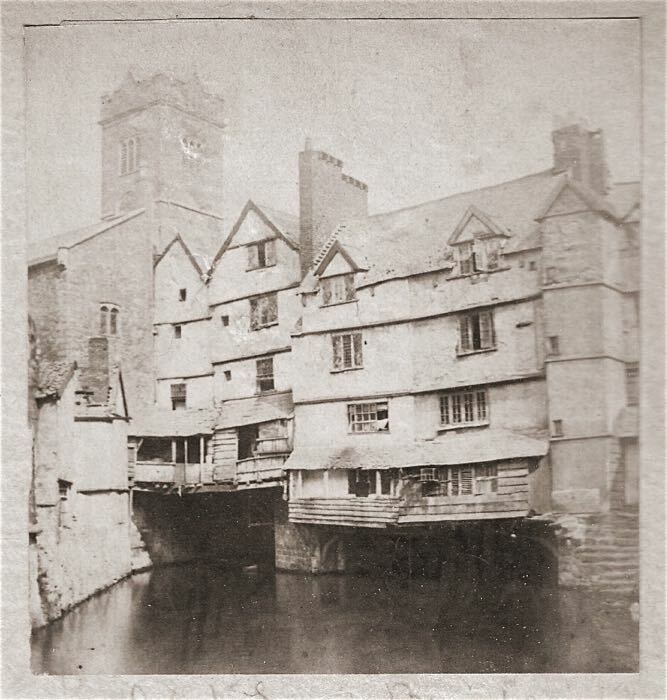 An early photo of St Edmund's from Bridge Street. The house mentioned left is the house abutting the wall. The old bridge was narrow so the church was built on columns to the side of the roadway, and the houses were supported on wooden beams and the piers of the bridge. 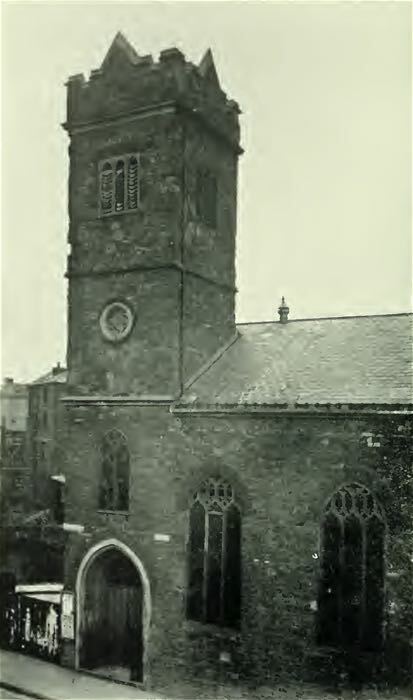 The church as it appeared circa 1910. This is the Victorian rebuild. The interior of St Edmund's Church. The church from the top floor of possibly the Teignmouth Inn. Edmund Street after the Merchant's House was moved in 1961. The City Brewery was occupying the house adjacent to the church, possibly as a store. 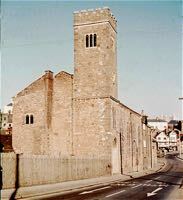 A fine colour photo by Alan H Mazonowicz of the church just before it was demolished. This is the point in the demolition of the church when it was realised that the old bridge was still beneath. Two of the columns that supported the church. The preserved remains of the old bridge and the surviving tower of St Edmund's. The Revd. Henry Vivian Panton, B.A.